As well as being the gateway to the skies, airports are popular among tourists. We have expanded our business network to 10 airports all over Japan. 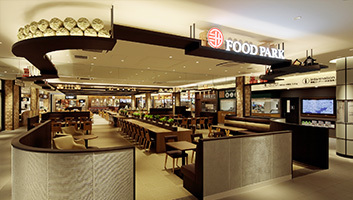 In 1951, we opened our first restaurant and retail store that was only 50sqm in Fukuoka Airport. We have since been providing air travelers and airport visitors with high-quality food and services. 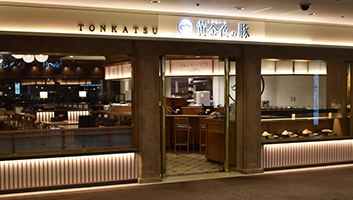 As a result, our network has grown nationwide from Hokkaido to Okinawa, and we now operate restaurants and retail shops in Japan's 10 major airports. 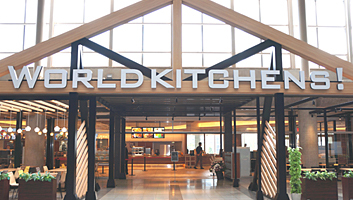 Through such initiatives as offering regional menus that use locally-produced ingredients, we have received high ratings from all of the customers that have visited each airport. 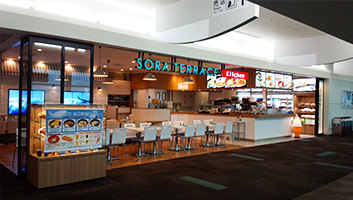 We will continue our efforts to create airport restaurants that make air travel more pleasant.Recently, we opened our Chowder's Soup outlet in the Seattle Terrace dining area of "Flight of Dreams", a commercial complex at Chubu Airport, in Oct 2018. With 11 locations throughout Japan, highway service area is a place to develop and promote local specialty menus. In the 1970s, along with the popularization of automobiles, highways were constructed at a rapid pace all over the nation. Royal, having predicted the coming of a motorized society, thought to provide highway travelers with high-quality food and service. 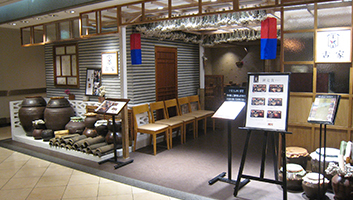 We opened a restaurant and retail store at the Mekari parking area in Kitakyushu, Fukuoka in 1973. 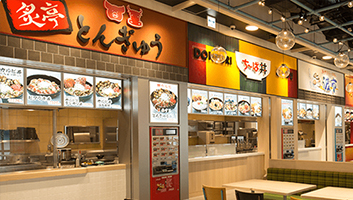 Since then, we operate restaurants, food courts, and retail stores at service areas and parking areas all over Japan, and offering local specialty, seasonal items and etc. We've created a large variety of menus that utilize our special know-how. We aim to be a part of your pleasant shopping experience. 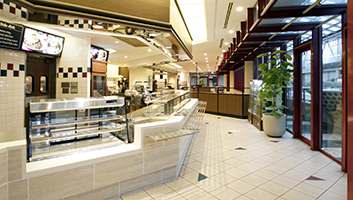 We focus on serving our department store partners and offer a variety of restaurants, such as casual dining with Japanese, Western and Chinese styles; Italian restaurants; Soba restaurants; Thai restaurants; coffee shops; cafeterias and bakeries. Customers from all walks of life can enjoy the authentic food and proficient services at each restaurant. We operate businesses in a variety of facilities including office, hospitals and etc. under the concept of “from cafeteria to dining restaurant”. 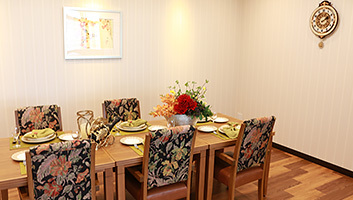 We put our utmost effort to provide a dining space to refresh your body and mind. 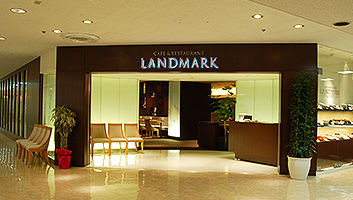 In 1990, under the concept of “from cafeteria to dining restaurant,” Royal established ROYAL MARRIOTT & SC Co., Ltd. It was renamed R&I DINING Co., Ltd. in 2005 and CENTRESTA Co., Ltd. in 2007 (now ROYAL CONTRACT SERVICE CORPORATION). We receive recognition from our customers for offering high quality food and service in office, social welfare facilities, factories and schools throughout Japan. The Japan World Expo '70 was our first step toward nationwide expansion. Royal exists where people gather. In March, 1970, Royal operated stores in the U.S. zone of the Japan World Expo '70 and its success was our first step toward our current nationwide business. Royal continued to operate stores at large-scale exhibitions such as the Asia Pacific Expo in 1989 to attain operational know-how. 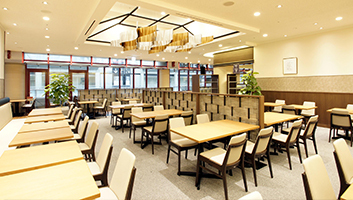 With these experiences, we also provide pleasant dining spaces in convention and conference halls, including Makuhari Messe, Tokyo International Exhibition Center, and Tokyo International Forum.